Femtosecond lasers are capable of processing any solid material with high quality and high precision using their ultrafast and ultra-intense characteristics. With the continuous development of laser technology, ultrafast laser manufacturing could become one of the primary methods employed in high-end manufacturing in the future. Recently, researchers have realized a new method of electron dynamics control for ultrafast laser micro/nano fabrication. For the first time, the localized transient electron dynamics can be actively controlled to manipulate material properties, which greatly enhances the efficiency, quality, uniformity and precision of laser fabrication. This research was conducted by the group of Professor Lan Jiang from Beijing Institute of Technology, in cooperation with Professor Tian-Hong Cui from the University of Minnesota, and Professor Yongfeng Lu from the University of Nebraska–Lincoln. Their research results were recently reviewed in Light: Science and Applications. 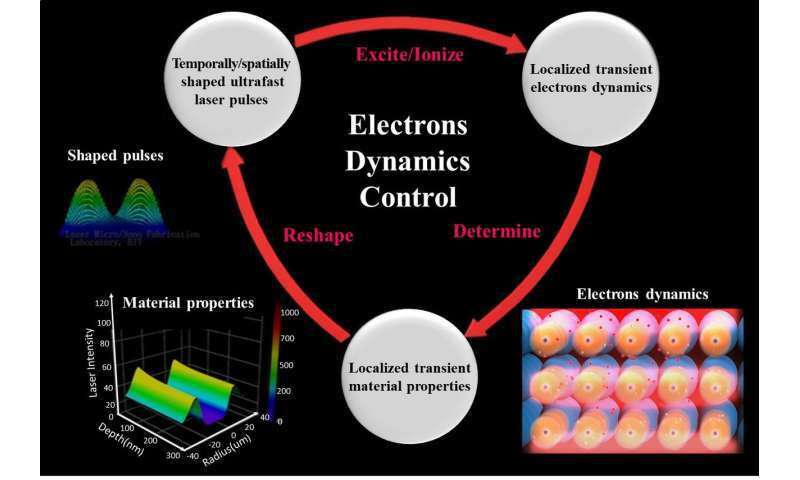 Over the past decade, the research group has devoted their efforts to studying novel methods of manufacturing based on electron dynamics control. They used the temporally/spatially-shaped ultrafast laser to control localized transient electron dynamics (e.g., density, temperature, and distribution); furthermore, they modified the localized transient material properties and adjusted material phase change; eventually, they implemented the novel fabrication method. They established a multiscale model of ultrafast laser materials interactions and predicted that the temporally/spatially-shaped ultrafast pulses can control the laser material interaction processes. Furthermore, on the basis of the theoretical predictions, they experimentally verified the validity of the electron dynamics control method. In addition, they proposed and implemented a multiscale measurement system for observing femtosecond laser ablation dynamics from femtosecond scale to second scale, which provided experimental evidences for the proposed mechanism. Using this method, they greatly improved fabrication efficiency, quality, repeatability and precision, and extended the fabrication limits of laser manufacturing. The new method has resolved some critical manufacturing challenges and already been applied to a series of major Chinese national projects. This novel method realizes the active control of localized transient electron dynamics in the laser fabrication process for the first time. Furthermore, it opens wide possibilities for the control of fabrication on the electron level, which may provide revolutionary contributions to high-end manufacturing, material properties manipulation, and chemical reactions control.